The Lollapalooza annual music festival will be held this weekend from July 28 to July 31, 2016 at Grant Park, Chicago, IL. Samsung wants to enhance the experience for Galaxy smartphone owners who are attending the festival. Among other benefits, Samsung will offer “VR-Palooza,” a VR experience that includes 360 livestreaming from the Samsung Stage using the Samsung Gear VR, and “4D VR” surfing, skateboarding, and hot air balloon VR experiences. Samsung will also make limited quantities of the Samsung Gear 360 camera (reviewed here) available for purchase for $349.99. 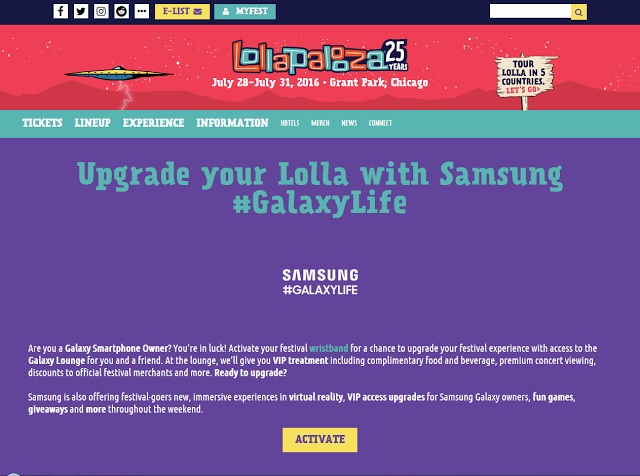 To participate, you’ll need to activate your Lollapalooza wristband here.